The Tennessee Map Plaza. The 200-foot granite map highlights the state’s major roads, 95 counties, rivers, interesting geographic formations and details of each county. The map is designed to scale -- 12 inches is equal to 2.5 miles. 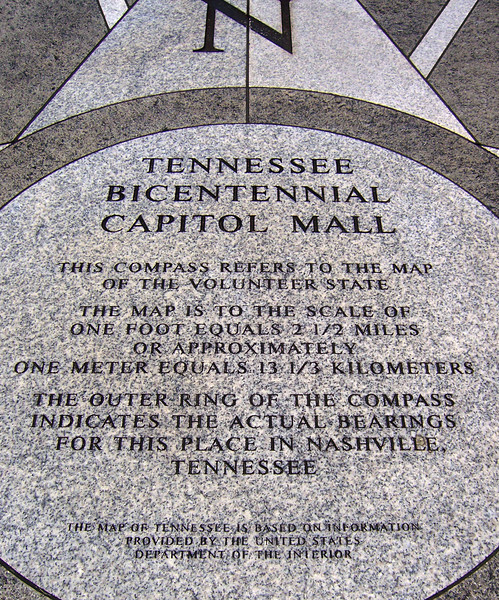 The Bicentennial Mall stretches 19 acres, connecting the Tennessee Capitol Building and the Germantown Historic District. The pedestrian mall opened in 1996, to commemorate the 200th anniversary of the state of Tennessee. Fashioned after the National Mall in Washington, DC, the park celebrates the state's history, recreational attractions, and natural wonder. The Bicentennial Mall offers a number of attractions, including a 1,400-foot Wall of History etched with historic events from the state's first two centuries, 31 fountains that each represent one of the state's rivers, and a 200-foot granite state map. The mall also preserves the only remaining view of the Capitol -- from the north side -- as a building boom in the late 1950s and early 1960s blocked the sight of the building from the east, west, and south sides of the city.